The first Web Cam was invented to monitor if the coffee was empty. 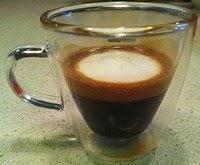 Espresso in Italian means "force something out"
The name Cappuccino comes from the resemblance of the drink to the clothing of the Capuchin monks. Caffeine increases your levels of adrenaline, and releases fatty acids from fat tissues, leading to a better physical performance by those who consume caffeine before working out. Goats discovered coffee: This is probably FALSE. The first reason this is a myth is that it can only be tracked to the mid 1600s, and coffee consumption (although not roasted) can be traced to over 1,000 years ago. The second and more convincing fact is that when they have offered goats, dried leaves, dried straw or coffee cherries, the goats only eat the cherries when everything else has been finished.